Tackle the challenges of today’s translational proteomics research armed with the right tools – with LUNARIS™ Tools. Our continuously growing portfolio of LUNARIS™ Kits, dedicated LUNARIS™ Reader, and unique LUNARIS™ Analysis Suite software deliver high-quality data from a variety of clinically relevant samples, so you can focus on what really matters: applying insights for disease progression and stratification, translating knowledge from model to man, and driving advances from lab to clinic. Simultaneous, specific, and sensitive detection of multiple disease-related biomarkers in sample volumes as low as 3 µL is the first step in the AYOXXA vision for successful translational research. 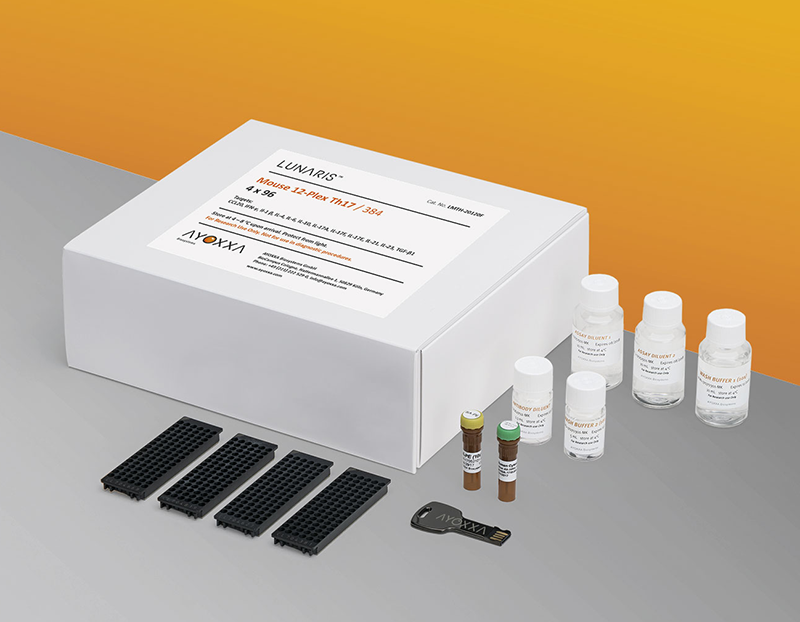 LUNARIS™ Kits quantify inflammation and immune response markers in a variety of clinically relevant samples, and supply all assay components to start your multiplex protein analysis today. The system is biomarker agnostic, so you can also construct custom panels. Our Services experts support screening, validating, and configuring the multiplex assay you need. High-resolution readout of fluorescence signals with flexible throughput is the second step of our workflow towards insights from translational research. The LUNARIS™ Reader is a fully integrated, benchtop precision instrument that handles automatic readout of LUNARIS™ Kits. Simply load your assay and press start. Intuitive and standardized evaluation of readout data to produce publication-ready results is the final step to power breakthroughs in translational research. 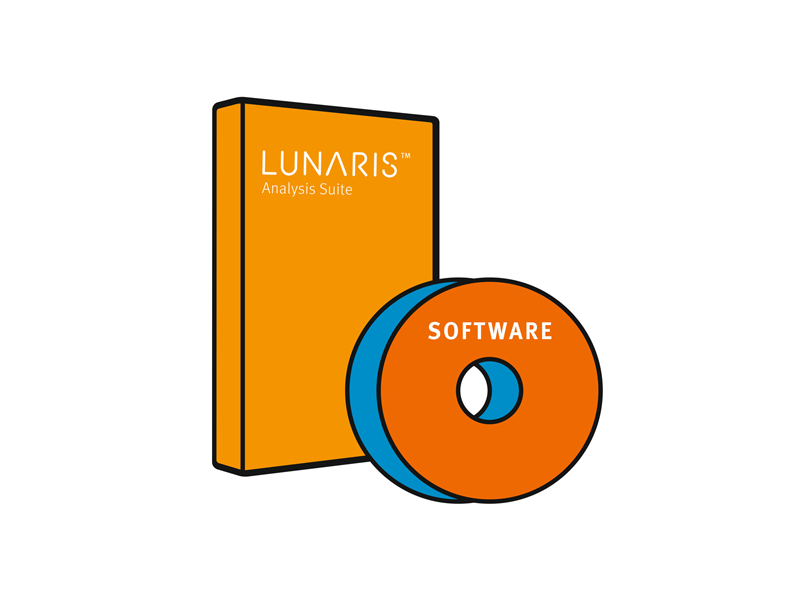 The LUNARIS™ Analysis Suite is a unique software solution designed to support your complete workflow – from experiment planning and setup, to careful scrutiny of assay quality, traceable evaluation of results, and customized reporting of insights. 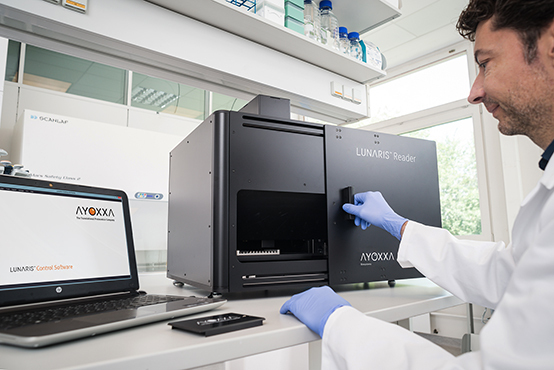 AYOXXA Services extends the productivity of your lab by taking over the analysis of your samples or developing novel bioassays and protocols on the LUNARIS™ Platform. Whatever your needs, our experts tailor their work to complement your research activities, so you can focus on results.